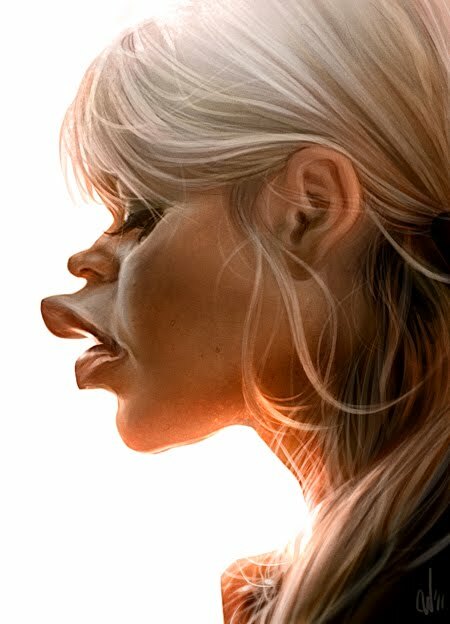 My second Bardot caricature for CS3000. This one was painted in Photoshop. Also below are a few steps in it's process. I don't usually start the rendering in black and white but because of the complex colour transitions, I decided to get the shading right first before tackling colours. REALY REALY REALY GOOD.. I know Bardot (Cause I m French) And this one is better than your first one.... so good... Well done..
That is stunning Chris - superb ! This is incredible, Chris! I hope you win! Great likeness and awesome rendering !! I like the way the light hit her skin. Your previous version of Bardot was already great by the way. Thanks guys!! Your comments are always appreciated. whaaaa. hoow? your.... I love it! super big mega awesome job Chris. Damien, David, Toby- Thanks guys! David- Basically I started to colourise it before adding the hair detail. So, pretty much just after step number two, I had a layer above the black and white set to colour mode, then just airbrushed or hard brushed the basic colours for the flesh tones, lighting and base hair colours. I then put another layer on top and started to add the hair detail in colour, not black and white. Because the brush I was using had opacity jitter, the gradients of colour from the colour layer below was showing through the painted hair detail and this helped add to the realism of the hair. It would have been a lot harder to achieve this if I had completed the render fully in black and white and then tried to add all this subtle colour detail on the colour mode layer. Eventually when I was about 80% finished I flattened the whole piece then just refined the rest of the detail in colour. Hope that helps explain the process for this painting. Thank you very much for your explainations Chris, indeed it helps a lot! ya know, i actually like the first step with the flat color as well. Me sumo a todo lo que han dicho Chris, espectacular!! wow. The way you've captured the light hitting her skin and the fine hairs around her ear is just amazing! superb work.